Kids know how much fun it is to play and move, but what they don’t know, is that they’re training for all the sports they will play later in life! 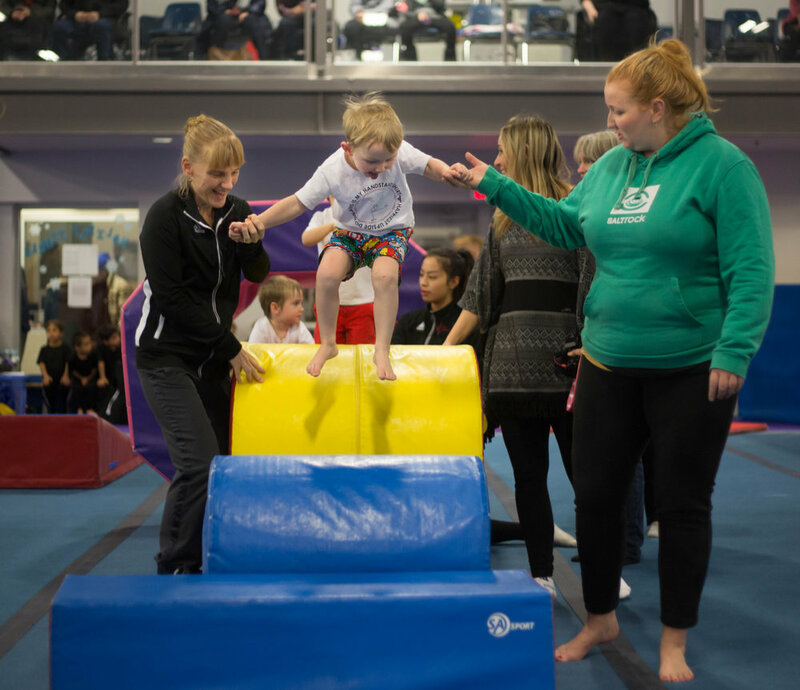 That’s why Active Start classes use unstructured play – climbing, running, rolling and jumping – in our coach-led classes to develop the ABCs of physical literacy: agility, balance, coordination and speed. Kids have fun and develop social skills like sharing and taking turns, while preparing for a lifetime of physical activity. Our Active Start classes range from fundamental movement skills to introductory dance classes. Visit our Drop-in page to learn about our drop-in program for kids 18 mos to 12 years old. This class is a great introduction for both babies and parents to physical literacy through gymnastics. This class will focus on achieving major developmental milestones through a variety of fun movement, songs and interactive activities. Guest Speakers will include child development specialists and nutritionist. Who is this class for? Parents with babies who would like an introduction to physical literacy through gymnastics. Class info: 30 minute class, once a week. Tots play and learn with their parents in a structured, coach-led class. They learn the basics of physical literacy, and develop coordination, balance and confidence by exploring risk and limits in a safe environment. Who is this class for? Parents who want to develop their toddler’s motor skills and coordination through play in a fun, social environment. Class info: 45 minutes, once a week. Independent 3’s move into the gym for the first time without mom or dad! Through circuits and play, they build their motor skills, strength and coordination: swinging, landing, rolling and climbing. The confidence and social skills they gain helps them become more independent. Who is this class for? Toilet-trained children who love to run, tumble and jump. Parents who want their children to develop their physical skills and gain confidence in a structured, but fun, class setting. Gym & Play is a two hour program for your child to run, jump, hop, learn and play. It is an hour of gymnastics followed by an hour of directed and creative play outside and inside, moving, exploring and connecting with nature. Our 4’s focus on fun and fitness and continue to develop the physical literacy skills that are at the core of all sports: hanging, swinging, balancing, kicking, catching, and jumping. The basics of gymnastic movements start to become familiar as they continue to develop their independence and gain confidence. Who is this class for? Children who enjoy tumbling, climbing and moving. Parents who want their children to develop their physical skills and gain confidence in a structured, but fun, class setting. Do you have a dancing gymnast in the house? This class consists of an hour of gymnastics plus 15 minutes of learning a basic choreographed dance routine that will be performed on the last day of class. Who is this class for? Budding performers who don’t want to have to choose between gymnastics and dance. Class info: 1.25 hours, once a week.